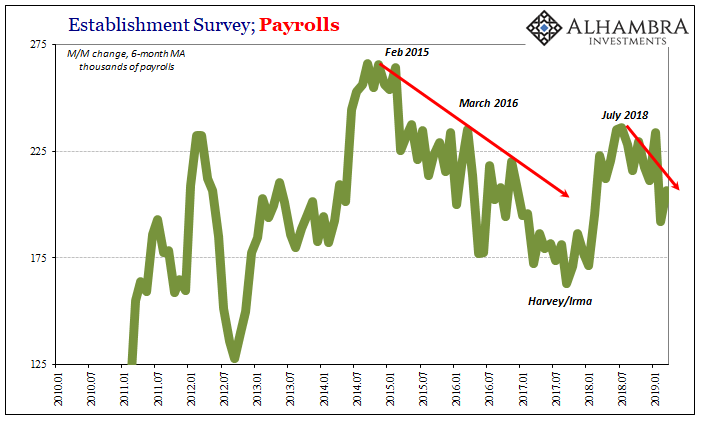 The payroll report for March 2019 continues to show signs of softening in the labor market. If this continues, however, this trend would be of the same type and leading in the same sort of general downturn direction. This fragile system is being hit by numerous global growth headwinds, some of which may already have already shown up in the domestic labor market. Milton Friedman was right about a lot of things. He was wrong about quite a bit, too. The stuff where he erred is what central banks now do in his name. The activist central bank is an outgrowth of monetarism, the academic approach to rethinking the Great Depression after Friedman and Anna Schwartz published A Monetary History. Toward the end of his life, he was more than a little annoyed. In one of the last interviews he gave just before he passed away in 2006, he quite vividly explained what would become one of the world's primary deficiencies. No accountability. The difficulty of having people understand monetary theory is very simple-the central banks are good at press relations. The central banks hire people and the central banks employ a large fraction of all economists so there is a bias to tell the case-the story-in a way that is favorable to the central banks. You don't say. We've observed this very case over the past year, two years or so. Beginning in 2017, there started to appear under this globally synchronized growth nonsense, first some scattered media stories about how construction workers or some such were becoming hard to find. And then it spread from there. By early 2018, the LABOR SHORTAGE was everywhere. 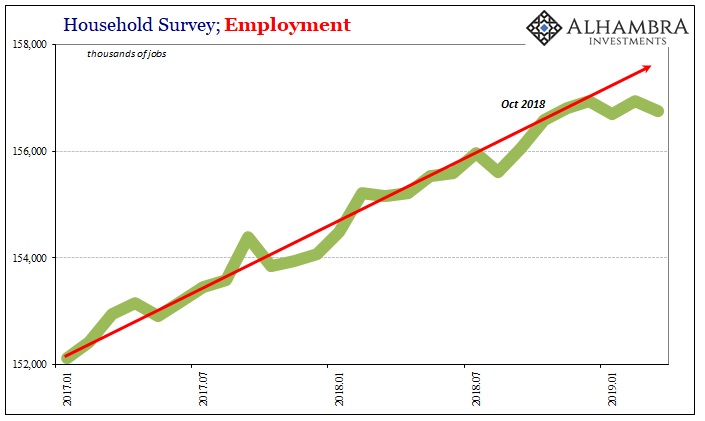 Under the official cover of more confident central bankers, first Janet Yellen at the end of her one term and then the hawk Jay Powell, for weeks on end, days at a time there would be some sort of mainstream publication touting the lack of workers in this booming US labor market. Funny, though, in 2019, you don't see them much anymore. The labor shortage was never downgraded, either, it just up and vanished. My own perception is anecdotal, of course, I've not taken the time to go back and actually count the number of stories and claims for each of the major publications (the Wall Street Journal and Bloomberg were, by far, the biggest offenders), but I did make it a habit to notice. Once inflation pressures were officially declared "muted" by the FOMC, neither hawks nor doves only chickens, suddenly we don't hear much about the exotic foods offered at corporate kitchens, highly flexible time schedules, or all the other highly creative ways companies were supposedly dealing with a systemic dearth of workers. Then again, the labor shortage, had it been real, would've vanished on its own if those same firms simply paid the market clearing wage. No creativity was ever required, just an actual booming economy. The payroll report for March 2019 continues to show signs of softening in the labor market. It isn't imminent recession, that's Europe's immediate worry. If this continues, however, this trend would be of the same type and leading in the same sort of general downturn direction. Labor market data is also lagging. The Establishment Survey is going to be volatile month to month, that's just the way the statistical process works. February's headline payroll gain was revised only a little, to +33k, while the first estimate for March was +196k. In truth, neither of those are good numbers. Both are below the current average, which has been falling since last summer. With Q1 now in the books, the pace of job gains is on track for the worst since 2009. It isn't all that different from any of those prior years really, but currently at the bottom end of what is already a very low growth range. There is also some detectible if short run softening in other metrics. Hours worked, for example, have displayed some weakness spanning now six months dating back to that October to December window. In March, total hours worked rose just 1.9% year over year, the second month in a row with an increase less than 2%. That's the first time this has happened since Harvey and Irma in 2017. The Household Survey has stalled out during that same time frame. The number of jobs being reported by employees last month was 156.7 million. Back last October, the same survey showed 156.6 million jobs. Six months and very little gained during them. 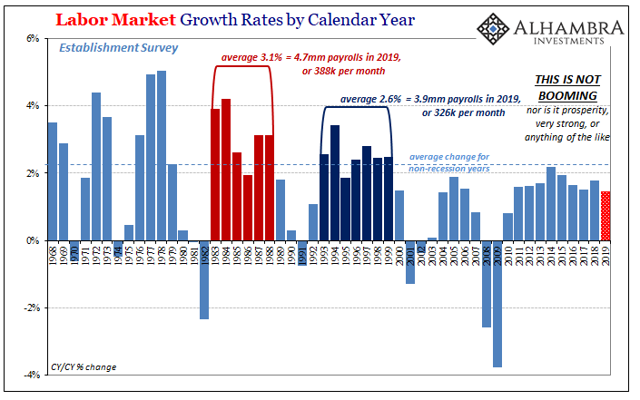 As you might expect, labor force growth has been soft as well. The big thing, though, is wages. In December, average hourly earnings rose 3.50% year over year, the highest in more than a decade. It fit the narrative which Jay Powell was selling at that moment. Even the number itself was reported within that same period, between the Fed's last "rate hike" and the Fed "pause" which came out just after the BLS in early January temporarily soothed everyone with one perfect payroll report. 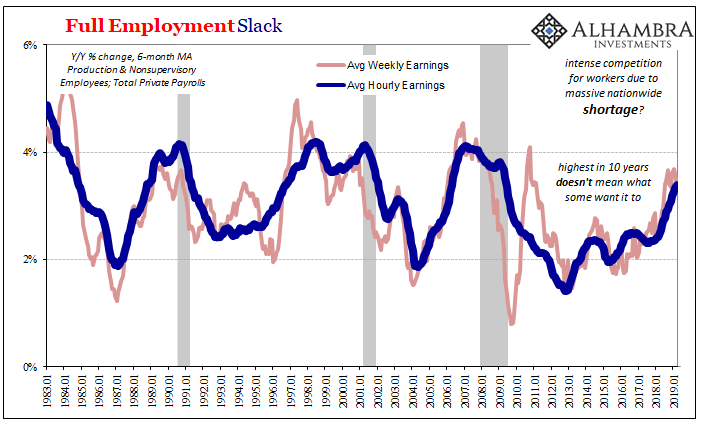 Wage gains haven't tumbled in the three months of 2019 so far, but they are importantly no longer accelerating. In March, average hourly earnings increased 3.33%, down from 3.48% in February. Better than three percent isn't bad, it just isn't a LABOR SHORTAGE, particularly if wages are stalling out here and more so with economic conditions under increasing scrutiny. The problem for everyone remains the unemployment rate. And that's true of even FOMC officials and all the Economists taking their cues from the central bank. From the very beginning, there has been this persisting problem and it's one that at first seems counterintuitive: the unemployment has fallen far, far faster than even the most optimistic projections projected. It has left the wrong impression. It seems like it should be a very good thing, indicative of an overly robust economy producing substantial labor gains. But that's clearly not what's been going on; we are still looking for 3% GDP, and 3% used to be a floor when the economy actually boomed. It isn't economic output. 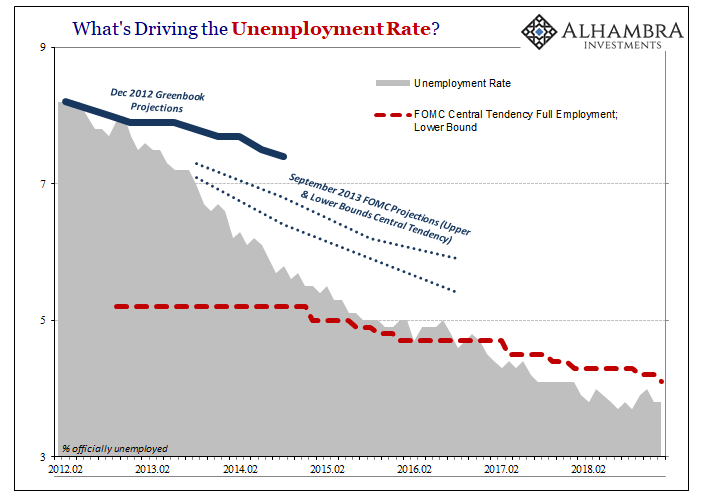 The unemployment rate has fallen much farther than it ever "should" have. The same participation problem remains unsolved; a high degree of hidden economic slack, as Yellen once reluctantly admitted, due to macro factors (not drug addicts and retiring Baby Boomers) which, Keynes once said, are the most evil. I think they [the FOMC] should drop rates and get rid of quantitative tightening. You would see a rocket ship. Despite that we're doing very well. Something has clearly changed. The greatest boom in forever which produced an epic LABOR SHORTAGE was undone by 241 bps federal funds? Nope. Fragile, not boom. 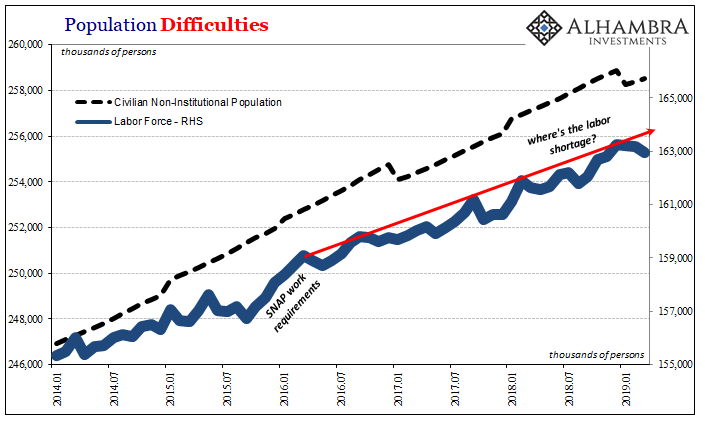 And now this fragile system is being hit by numerous global growth headwinds, some of which may already have already shown up in the domestic labor market.